"Rhino one to rhino two!" As the call sign is repeated over walkie-talkies by technicians on elephant back, the giant beast tenses and rears her head, her calf standing nervously by her side. The rifleman takes aim and scores a perfect hit in the mother rhino's rear, piercing the armour plating and delivering the tranquilizer M99 (etorphine hydrochloride). Ten minutes later, the calf is also shot. Both are down within minutes.It's 9.30 am, and the beginning of a long day and night for the rhinos. 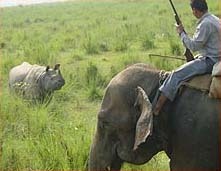 Both are off with a one-way ticket to Nepal's Royal Bardia National Park, about 300 kilometres to the west of their current home in Royal Chitwan National Park.At first glance, moving healthy and apparently happy rhinos halfway across the country seems like a strange — not to mention dangerous — thing to do. 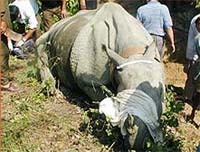 But the operation is part of Nepal's hugely successful rhino conservation programme. In the late 1960s there were less than 100 greater one-horned rhinos (Rhinoceros unicornis) left in Nepal. Thanks to conservation projects developed by the King Mahendra Trust for Nature Conservation, His Majesty's Government of Nepal's Department of National Parks and Wildlife Conservation, the Biodiversity Conservation Network, and WWF, Nepal is now home to over 600 rhinos, with Royal Chitwan National Park having the second-largest population in the world. But with this success has come conflict. As natural invasions of trees shrink their grassland habitat, the growing rhino population increasingly competes with humans. The animals have destroyed crops and caused human casualties, often leading to retaliatory actions from affected farmers. And, even though the population has increased, it is still vulnerable. 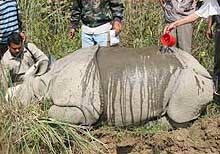 "In 1986, Nepal's rhinos were only found in Royal Chitwan National Park," explains Shyam Bajimaya, Translocation Task Force Coordinator and chief ecologist for Nepal's Department of National Parks and Wildlife Conservation. "A single disease epidemic or massive poaching outbreak could have been catastrophic. We needed, and still need, to translocate them to build viable populations elsewhere so they won't go extinct in Nepal." Which is why the mother and calf are being taken to Bardia, where a population of rhinos has gradually been built up over the last 17 years. With the rhinos out for the count, Dr Shanta Raj Gyanwali, Team leader for the Technical Team of the Translocation Task Force, dismounts his elephant, puts a cloth over the rhinos' eyes, and begins the preparations. Time is of the essence here — the vet wants the animals asleep for as short a time as possible. As a pit is dug within inches of the rhinos, technicians take numerous measurements: length, temperature, breathing patterns, and other vital statistics. A radio collar is quickly attached to the mother. When the pits are ready, the rhinos are rolled onto sleds placed in the pits — 20 people are needed to move the mother. A tractor then moves the sleds into specially designed crates inside two waiting trucks. 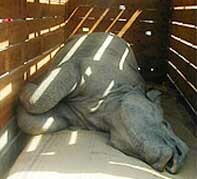 Just before the crate doors are closed, the vet administers the antidote — the mother rhino heaves, groans and then stands up, followed by her calf in the other truck. They are taken to a cool, shady spot, to wait for the overnight trip to Royal Bardia National Park.The rhinos are transported during the night because it's much cooler — an overheated rhino is a major concern during the sedation and transportation procedures. In addition, the traffic is lighter at night, which makes for a shorter drive on the often-unpredictable winding mountain roads. At 4 pm, the long, slow, and uncomfortable journey begins. For the next 15 hours the rhinos travel in a bright green and blue Tata truck decorated with painted stars and mountain scenes, multicoloured tinsel, and Hindu icons. Along the road are constant reminders of the Maoist insurgency. Thankfully, a cease-fire has been in place for three months and tensions have decreased, but the army checkpoints are still a little eerie. For the rhinos, it's less of a problem. The army has been warned in advance and red flags fly from the wing mirrors of the Tata, indicating there's very special cargo aboard. Finally the rhinos arrive at the Babai Valley in Royal Bardia National Park, where the mother rhino is the first to be released. After her truck has backed into position at a specially designed release site, the vet makes one final check and then turns the proceedings over to the park staff. 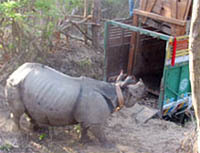 The crate door is lifted and the animal backs out, snorting unappreciatively at her "captors" before bolting off into the jungle in a cloud of dust. The empty truck is quickly replaced with the one holding the young rhino. The park staff want to release her as soon as possible so she can join her mother. But she has other ideas. Safely ensconced in trees and on top of the trucks, we watch as the door is lifted. We wait… And wait… And wait… Finally, one staff member gets off the truck and peeks inside: the baby is sound asleep! And, after such a long, stressful night, she seems to have no intention of waking up. The staffer throws a few branches at her, but no response. Finally, after throwing several other items at the thick hide, he gets a reaction and quickly flees for the safety of a nearby tree. Slowly, the young rhino backs out on wobbly legs, looking understandably disoriented. Initially, she heads toward the jungle, but then she changes direction and heads straight for the truck that had carried her mother, with the comforting smells that she has missed for the past 24 hours. But she is soon off for what must be a joyful reunion and a new life in the Babai Valley. It's been a long two days for Gyanwali and he now has to head back to Chitwan to resume the captures. But you can see the exhilaration on his face at another successful release. "Phew!" he exclaims, a broad smile crossing his face. "Nothing could be better than this. It's an incredible feeling to know that you are contributing to the conservation of endangered species like rhinos." Back in Chitwan, Dr Swoyambhu Man Amatya, Director General of Nepal's Department of National Parks and Wildlife Conservation, is also pleased with the operation's success. "Before we started in 1986, we were extremely cautious about the potential of translocating any animals, but now it's considered a normal operation and we are encouraged about the possibility of moving other species." Thanks to the operation, the rhino population at Royal Bardia National Park is now almost 100, the minimum number recommended by the Asian Rhino Specialist Group, an expert panel of scientists, as necessary for a viable population. 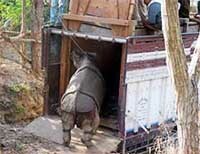 This year's translocation of ten rhinos will therefore be the last to Bardia for the time being. But that doesn't mean that the work is over. Monitoring the rhinos via the radio collars attached during their capture is essential for measuring the success — or failure — of the translocation programme, says Gopal Upadhyay, Chief Warden of Royal Bardia National Park. "It's an investment in the future. We need a continuous permanent monitoring system to record changes in the population and habitat and provide feedback to the management team. "The park is also building its capacity to fight poachers — a constant threat to the survival of rhinos, as well as tigers and other large mammals of the region.And, the translocations will continue. 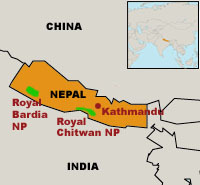 The next target site is Royal Shuklaphanta Wildlife Reserve in Nepal's far southwestern corner. Scientists first need to be sure this smaller protected area can handle a large population. Feasibility studies have already begun to see if breeding population can be established here. All in all, the future of Nepal's rhinos is a lot more certain than 40 years ago — something the Nepalese can be very proud of. “The success of this programme is a testament to the home-grown skill of Nepalese conservationists,” says Dr Chandra Gurung, WWF Nepal’s Country Representative. * Lee Poston is Senior Communications Manager at WWF-US. Greater one-horned, or Indian, rhinoceroses (Rhinoceros unicornis) once ranged from Pakistan across northern India to Nepal, Bhutan, and the border with Myanmar (Burma), and perhaps into southern China, living in floodplain grasslands and adjacent forests and swamps. Today, they are confined to a few small, protected populations in India and Nepal totalling about 2,100 animals. Their distribution is restricted by habitat modification such as cultivated areas, pastures, and modified woodlands. The species is listed as endangered on the World Conservation Union's (IUCN's) Red List of Threatened Species. Located in the shadow of the Himalayas, the Terai Arc covers 5 million hectares from Nepal's Bagmati River in the east to India's Yamuna River in the west. It provides critical habitat for greater one-horned rhinoceros, royal Bengal tigers, Asian elephants, 80 other mammal species, 47 reptile and amphibian species, 556 bird species, and more then 2,100 flowering plant species. It is also home to more than 6 million people who depend on its resources for their livelihoods and includes four protected areas in Nepal: Parsa Wildlife Reserve, Royal Chitwan National Park, Royal Bardia National Park, and Royal Suklaphanta Wildlife Reserve. The Terai Arc forms part of the Terai Duar Savannas and Grasslands ecoregion, one of WWF's Global 200 ecoregions — a science-based global ranking of the world's most biologically outstanding habitats and the regions on which WWF concentrates its efforts. In WWF Nepal's Terai Arc Landscape (TAL) programme, WWF and its partners are working to restore and reconnect eleven national parks in Nepal and India to create one continuous Terai Arc landscape. The work includes species conservation, awareness raising, income generation, and capacity building. The geographical designations given here do not imply the expression of any opinion whatsoever on the part of WWF concerning the legal status of any country, territory, or area, or concerning the delimitation of its frontiers or boundaries. Preparing to shoot the tranquilizer dart. Keeping the captured baby rhino cool. The baby rhino on the truck. 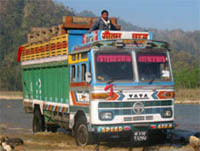 The Tata truck with its special delivery crosses the Babai River. Free at last! The mother rhino glares at her captors before heading off into the jungle. The baby rhino finally backs out of the crate.